If you've always dreamed of living in the city of Dante, Michelangelo, Machiavelli or the Medici family, the new "Palazzo Gamba" is the perfect address for you. 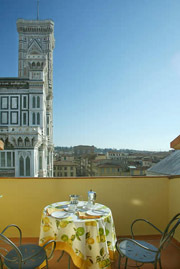 The views from this palace are unique, dominating the Duomo and Brunelleschi's dome. 3 double bedrooms, kitchen, living room with open fire place, 2 bathrooms (one with Jacuzzi tub) and two terraces with incomparable views over the Duomo and the city (maximum 6 persons).